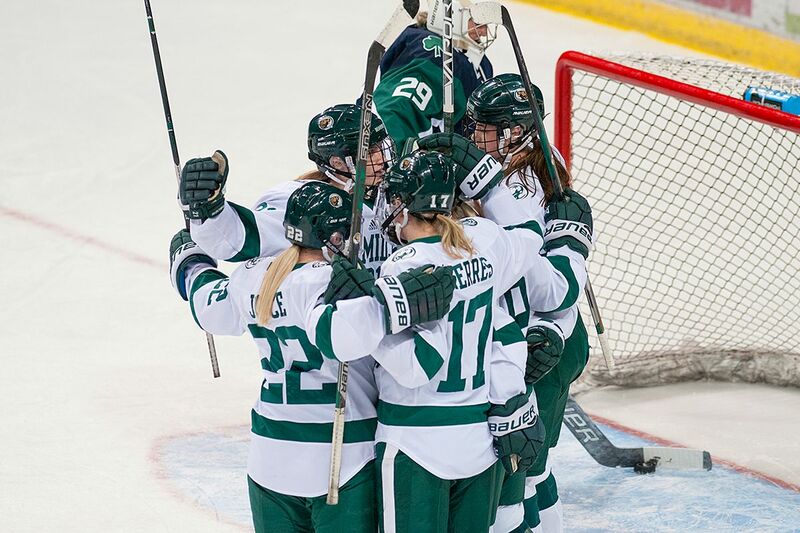 The Bemidji State University women’s hockey team defeated Minnesota Duluth, 2-1, in game one of their best-of-three series in the first round of the WCHA playoffs yesterday. Senior Emma Terres scored the game-winning power-play goal with 12:47 left to play while freshman Kerigan Dowhy stopped 29-of-30 shots in the win. Dowhy finished with 29 saves in the game including 13 in the final period in her first collegiate postseason start and remains undefeated on the season with a 4-0-1 record. Senior Bailey Wright scored the Beavers’ game-tying goal followed by Terres’ game-winning goal for the Beavers’ lone tallies while Alexis Joyce, Mak Langei and Emily Bergland each added an assist. Bemidji State will go for the series sweep today at 2:07 p.m. Our Benusa Pregame Show beings at 1:30 p.m. today on KPMI 1300 The Legends and online at www.beaverradionetwork.com. Hi Kelly Hi Lady Beavers! Cheering you on from the top of my lungs! Snowing in Little Canada, MN and grandpa George Beebe is hoping that Beavers can snow the Bulldogs. Listening from Mesa, AZ. with Kiki’s Uncle, Aunt and 2 cousins. Sunny but only 65 GO BEAVERS you can do it!! Great to hear this game in Hoyt Lakes Mn Thanks Kelly and all! listening from Rockford MN. Abby’s grandma Eunie having a hard time sitting still with this game. Come on Beavers you can win this yet. Go Beavers. It’s snowing like crazy here. Listening from Bemidji today. Go Beavers!!! You can do this!! Listening in from Bemidji today. Go Beavers!! You can do this! !